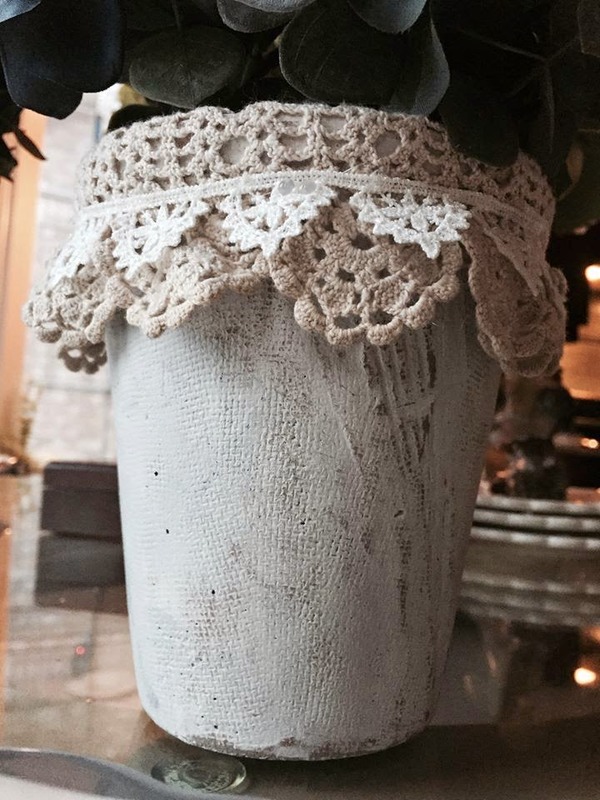 ...unless you happen to have some vintage looking lace, appliques and trim. I actually got mine from the thrift shop. Every time I go there I pass by the sewing section and find amazing things, check it out, you may find great stuff!! 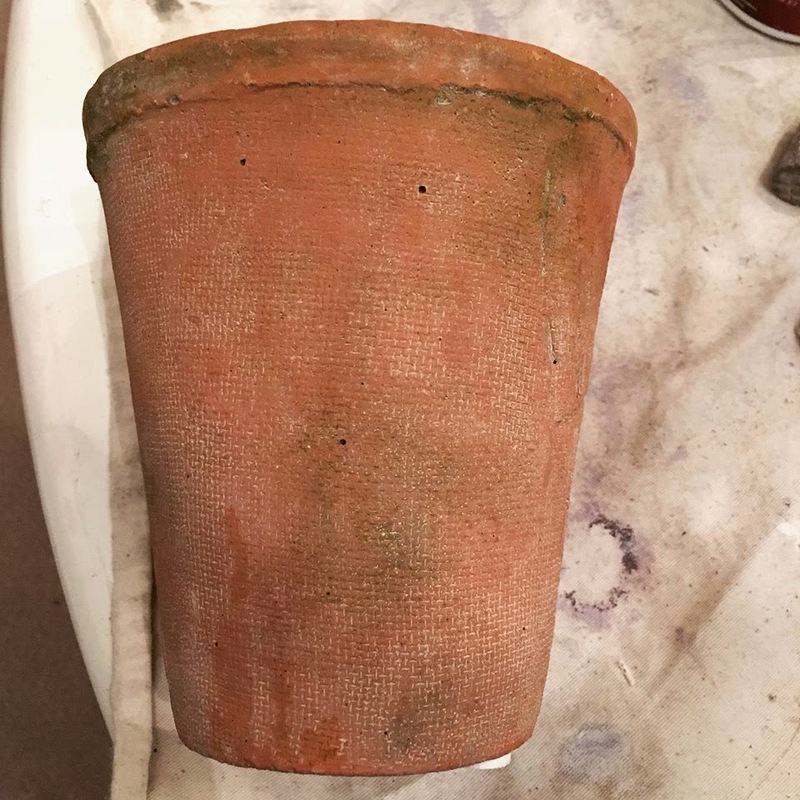 * A flower pot, I found these ones with texture in them but you can try this with the regular ceramic pots found anywhere. Its a nice shade of golden grey. I covered the entire outside of the pot but left the interior intact in case I decide to put a real plant one day so the paint didn't hurt the plant. 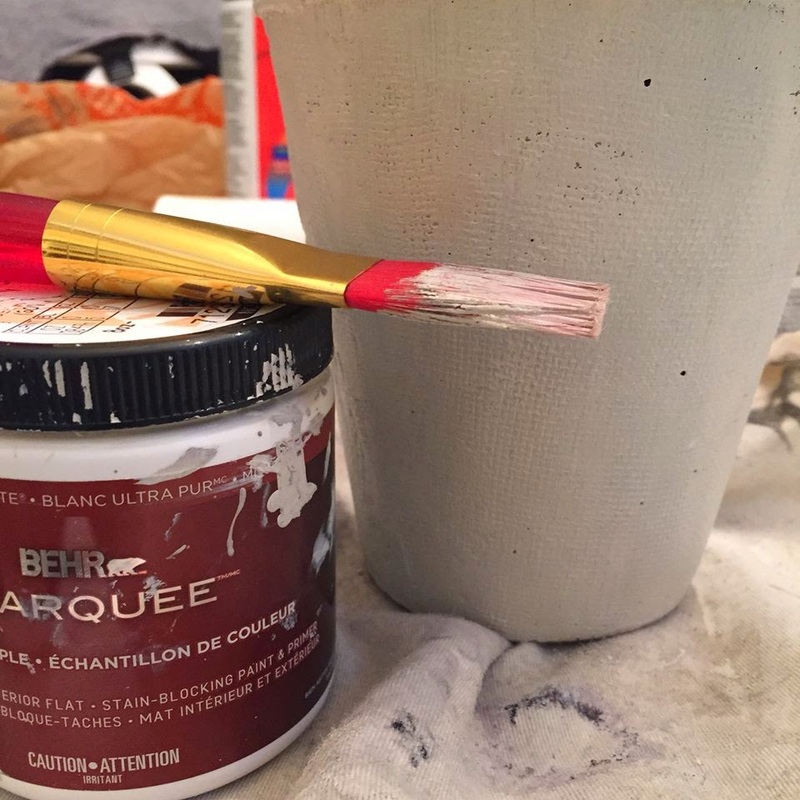 I sanded the pot after it dried for extra character. 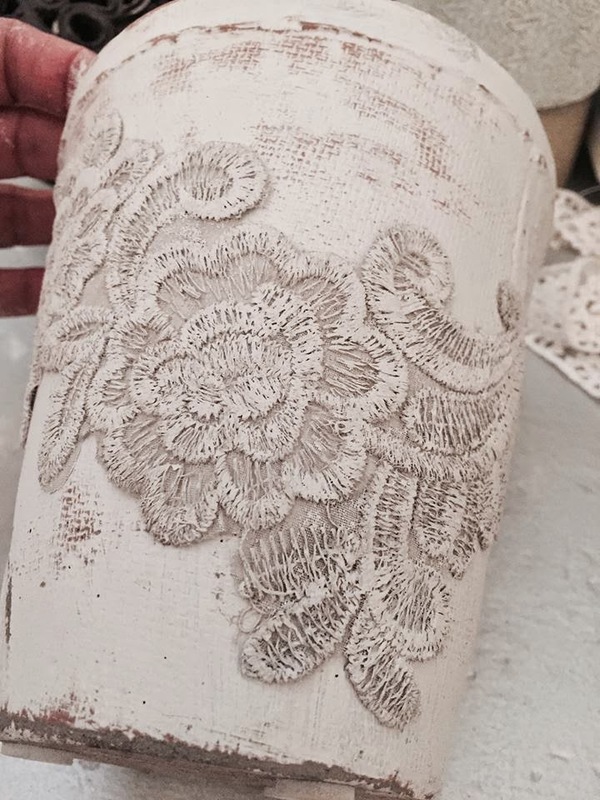 I then painted the applique with the same paint, I only did one applique and saved the other for another project. I then glued the applique to the pot, I used some hot glue but if you're going to use that make sure you apply it thinly and on the edges so it doesn't "bleed" through the fabric. 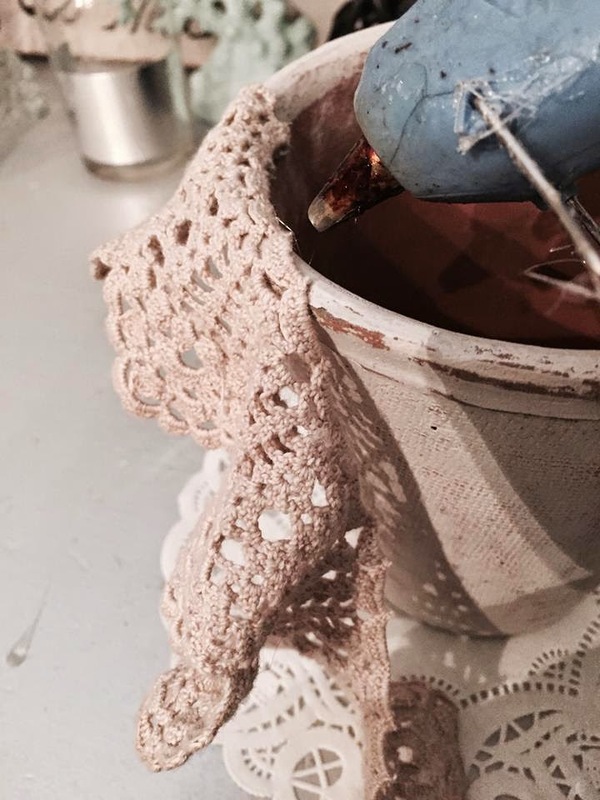 Now I'm going to show you how I made the other flower pot using a doily. 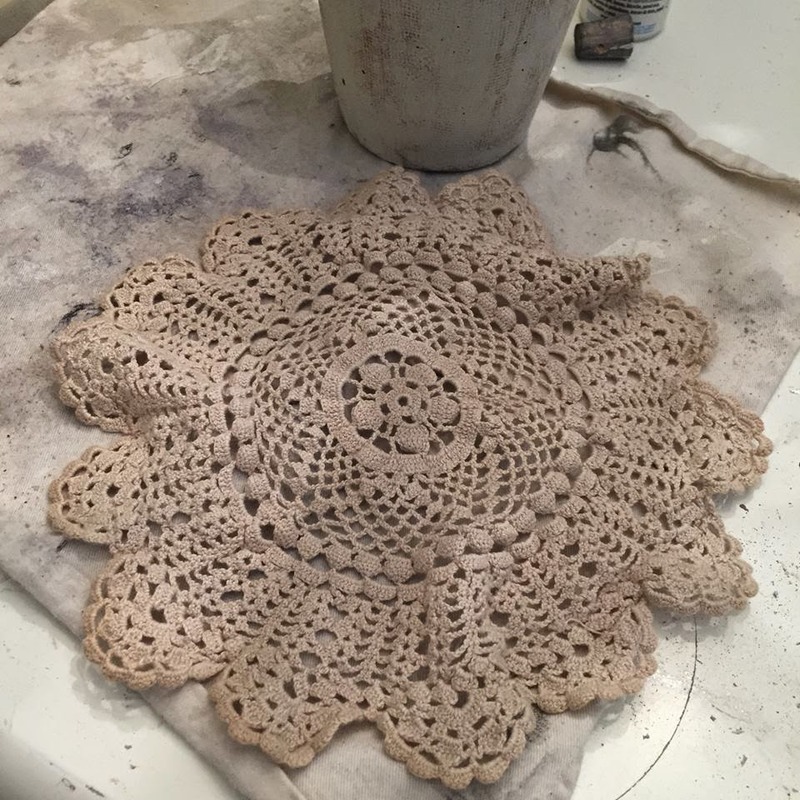 Doilies are very easy to find nowadays, you can go to the thrift shop, garage sales or even ask your grandma but if you still can't find it, Michaels has them too...but the new type... I prefer the vintage feel for this project so if you end up with a newer type, wash it in tea for a few minutes, dry and use... it'll look just as old as mine. 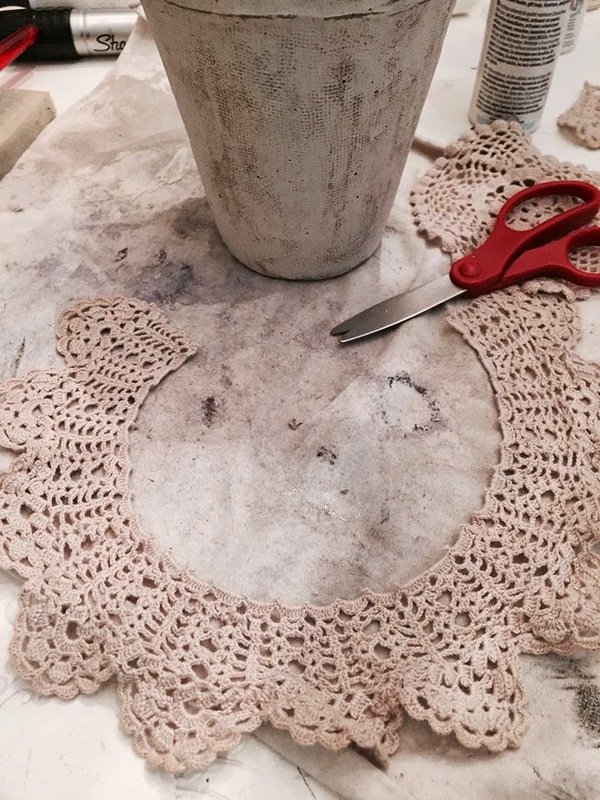 I cut the center of the doily to create the trim. I then glued it onto the edge of my pot with hot glue. 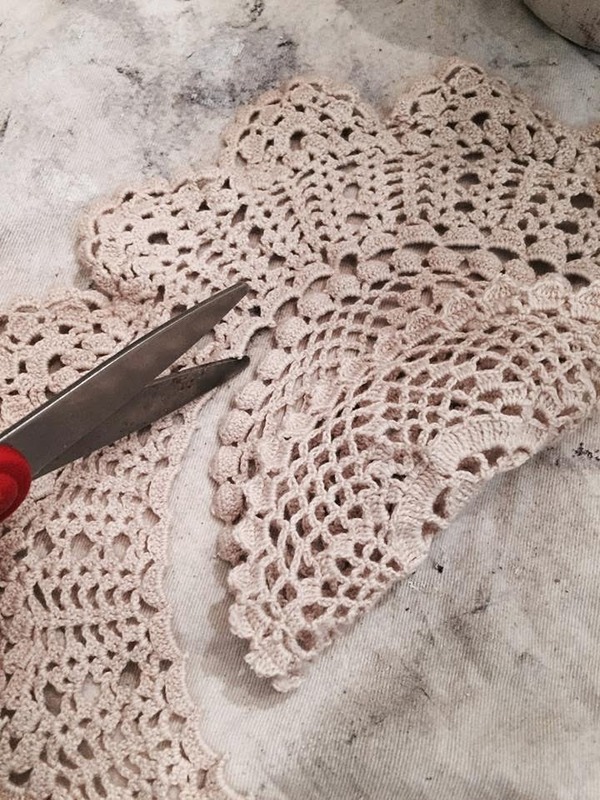 And I also glued the beautiful lace trim on top of the doily. And this is how they looked together. 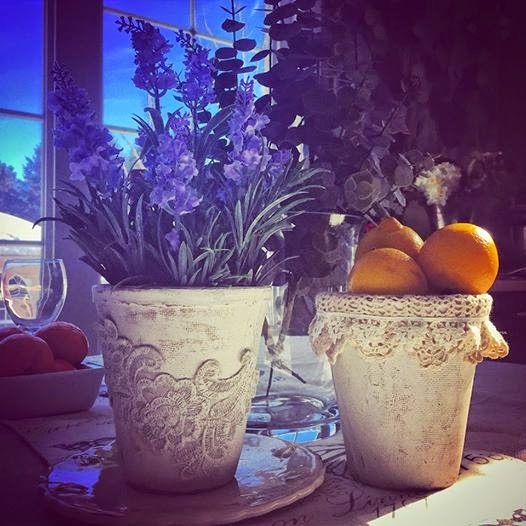 I absolutely adore the way they add that French vintage feel to my decor...I've had many complements from friends that said they looked genuinely old. Thanks for visiting my Blog and please leave a comment. Thanks for sharing this! I am going to do this, as soon as we have moved into our new place! I really like this idea. Have everything so this should work. I just wish that your instructions would be in black fonts and not light bleu. I did it!!.. 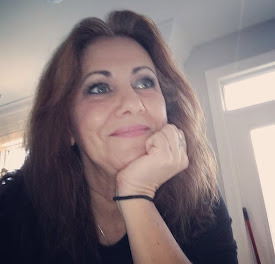 I changed all my text to black... now I have to do the rest of my entire blog... :0) thank you so much for your comment, I needed this kind of feedback as I'm trying really hard to reach a larger audience to spread the joy of crafting and to inspire others, GRACIAS!! Beautiful! I love these! Will have to make these. Always trying to find new things. Thanks for sharing! 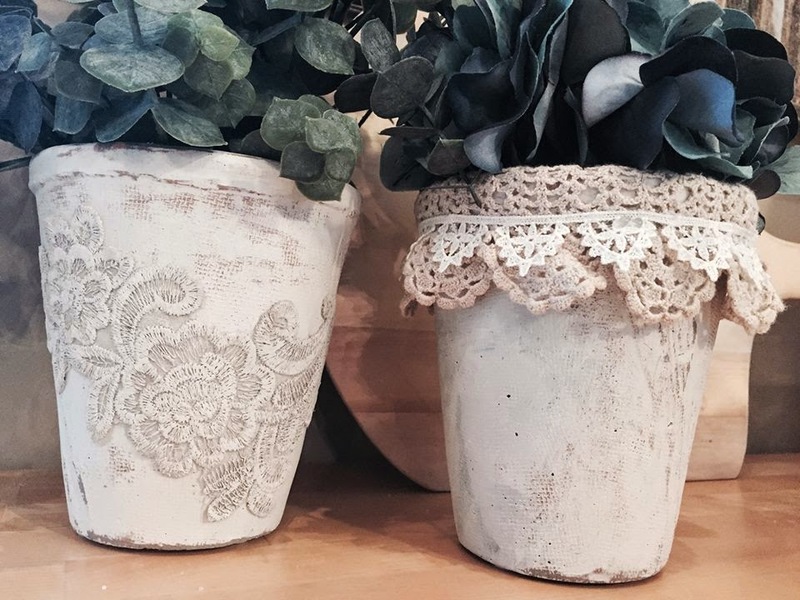 Victoria, these pots are absolutely beautiful! 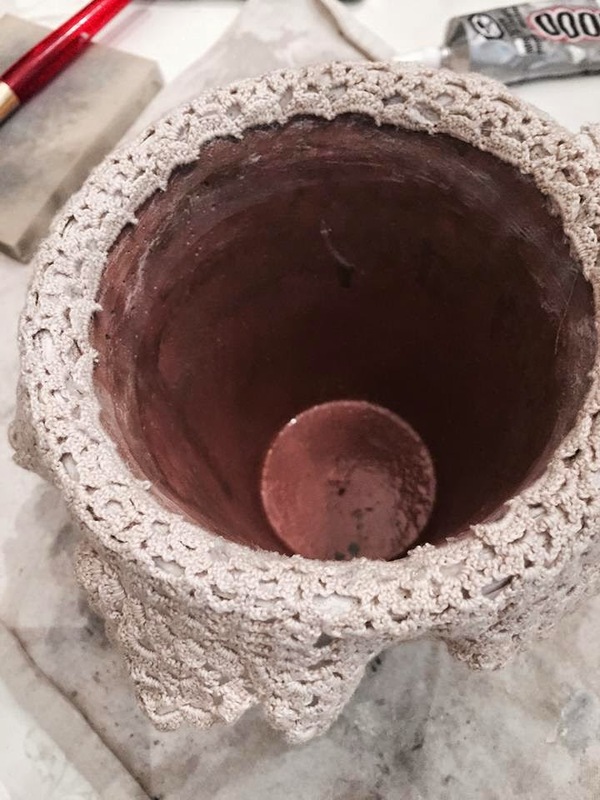 I have never seen pots that have that kind of texture before. The ones around here are all smooth. 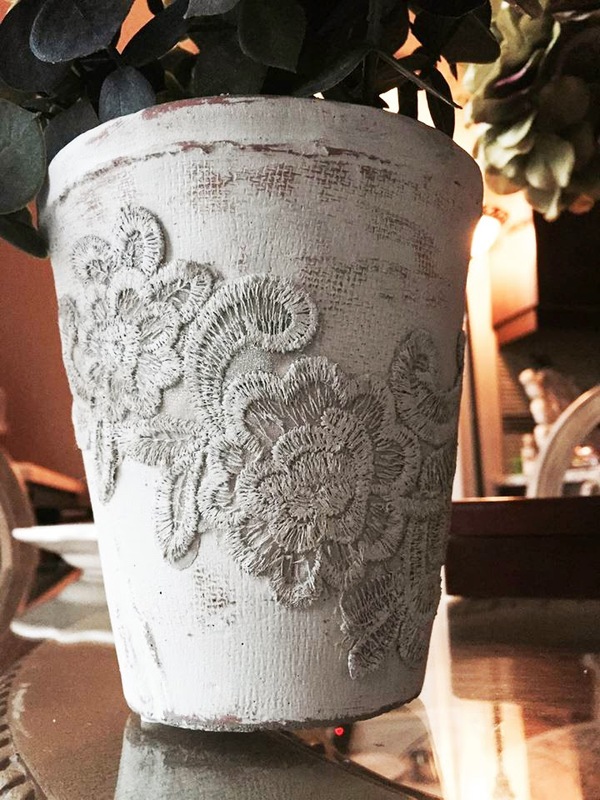 I think the textured ones are what adds to the beauty of the pot with the doily. Still going to try this though. Thank you for sharing your inspiration. Have a Blessed day. Awesome! Definitely look like they are from a high end boutique. I love them both. Thank you for sharing. 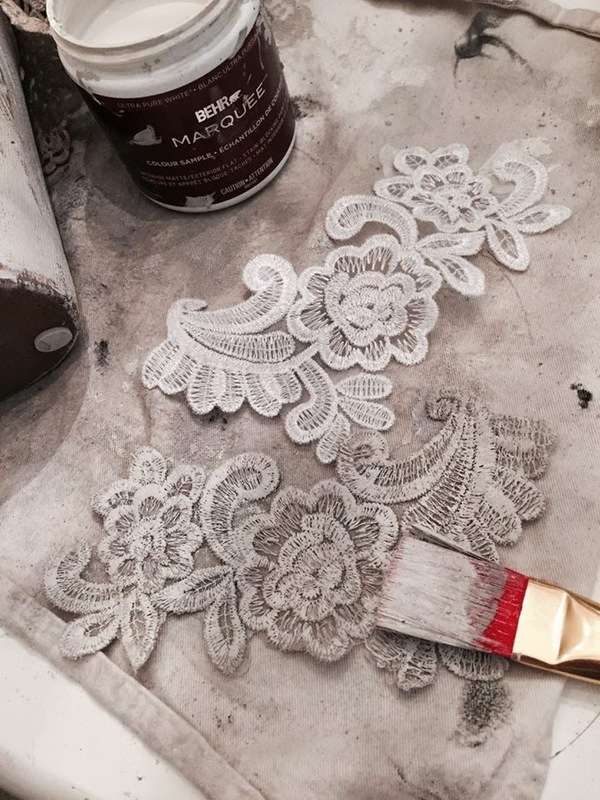 I actually bought wedding lace pieces off Etsy so I'm set to go. Thanks!!... would you mind sharing your end project with us when you're ready?... Tha'll be great! 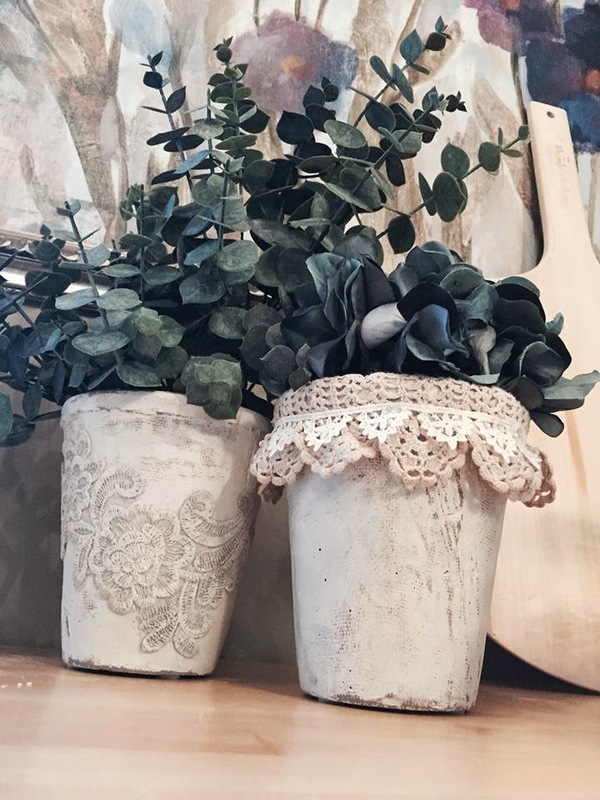 I love the look of these pots. I would probably use them in a guest room with fresh flowers, or with makeup brushes in them for the bathroom. 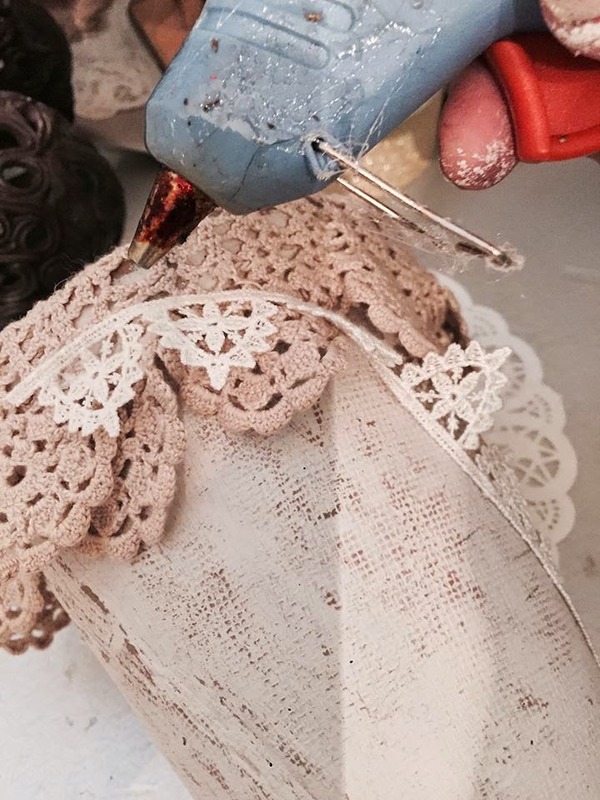 The thrift stores near me usually have little grab bags of miscellaneous laces and trims for a reasonable price.